AIM-7 Sparrow AIM 7 HAFB Museum.jpg AIM-7 Sparrow at Hill Air Force Base Museum. Type	Medium-range, semi-active radar homing air-to-air missile Place of origin	United States Service history In service	1958 (Sparrow III) Used by	Australia, Canada, Egypt, Greece, Iran, Israel, Italy, Japan, Jordan, Kuwait, Malaysia, Saudi Arabia, Singapore, South Korea, Spain, Taiwan, Turkey, United Kingdom, United States Production history Manufacturer	Raytheon Unit cost	$125,000 Produced	AIM-7D: 1959 AIM-7F: 1976 AIM-7M: 1982 No. built	70,000+ Variants	Sparrow I: AIM-7A Sparrow II: AIM-7B Sparrow III: AIM-7C, AIM-7D, AIM-7E, AIM-7E2/Skyflash/Aspide, AIM-7F, AIM-7M, AIM-7P, RIM-7M Specifications Weight	510 lb (230 kg) Length	12 ft (3.7 m) Diameter	8 in (200 mm) Warhead	High explosive blast-fragmentation AIM-7F/M: 88 pounds (40 kg) Engine	AIM-7A/B/C - Aerojet 1.8KS7800 solid rocket AIM-7D/E - Rocketdyne MK 38/MK 52 solid rocket AIM-7F/M/P - Hercules MK-58 solid-propellant rocket motor Wingspan	2 ft 8 in (0.81 m) (AIM-7A/B) Operational range AIM-7C: 11 kilometres (6.8 mi) AIM-7D: 32 kilometres (20 mi) AIM-7E/E2: 45 kilometres (28 mi) AIM-7F/M/P: 70 kilometres (43 mi) Speed	AIM-7A/B: Mach 2.5 AIM-7C/E/F: Mach 4 Guidance system semi-active radar Launch platform Aircraft: McDonnell Douglas F-4 Phantom II McDonnell Douglas F-15 Eagle General Dynamics F-16 Fighting Falcon Grumman F-14 Tomcat F/A-18 Hornet JA-37 Viggen F-104S Starfighter Tornado F.3 ADV F/A-18E/F Super Hornet Mitsubishi F-2 The AIM-7 Sparrow is an American, medium-range semi-active radar homing air-to-air missile operated by the United States Air Force, United States Navy, and United States Marine Corps, as well as other various air forces and navies. Sparrow and its derivatives were the West's principal beyond visual range (BVR) air-to-air missile from the late 1950s until the 1990s. It remains in service, although it is being phased out in aviation applications in favor of the more advanced AIM-120 AMRAAM. The AIM-7 Sparrow is an American, medium-range semi-active radar homing air-to-air missile operated by the United States Air Force, United States Navy, and United States Marine Corps, as well as other various air forces and navies. Sparrow and its derivatives were the West's principal beyond visual range (BVR) air-to-air missile from the late 1950s until the 1990s. It remains in service, although it is being phased out in aviation applications in favor of the more advanced AIM-120 AMRAAM. The early Sparrow was intended primarily for use against larger targets and especially bombers, and had numerous operational limitations in other uses. Against smaller targets, the need to receive a strong reflected radar signal made achieving lock-on at the missile's effective range difficult. As the launching aircraft's own radar needed to be pointed at the target throughout the engagement, this meant that in fighter-vs-fighter combat the enemy fighter would often approach within the range of shorter-range infrared homing missiles while the launching aircraft had to continue flying towards its target. Additionally, early models were only effective against targets at roughly the same or higher altitudes, below which reflections from the ground became a problem. A number of upgraded Sparrow designs were developed to address these issues. In the early 1970s, the RAF developed a version with an inverse monopulse seeker and improved motor known as Skyflash, while the Italian Air Force introduced the similar Aspide. Both had the ability to be fired at targets below the launching fighter ("look-down, shoot down"), were more resistant to countermeasures, and much more accurate in the terminal phases. This basic concept was then made part of the US Sparrows in the M model (for monopulse) and some of these were later updated as the P model, the last to be produced in the US. Aspides sold to China resulted in the locally produced PL10. 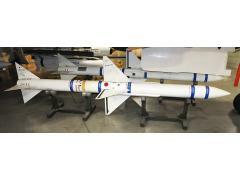 The Japan Self-Defense Forces also employ the Sparrow missile, though it is being phased out and replaced by the Mitsubishi AAM-4. The Sparrow was also used as the basis for a surface-to-air missile, the RIM-7 Sea Sparrow, which is used by a number of navies for air defense of their ships. Fired at low altitude and flying directly at its target through the lower atmosphere, the range of the missile in this role is greatly reduced. With the retirement of the Sparrow in the air-to-air role, a new version of the Sea Sparrow was produced to address this concern, producing the much larger and more capable RIM-162 ESSM.